Learning to Hear Chord Changes: Feeling frustrated with your chording? Don’t despair! We can help! We can teach you to hear chord changes. By starting simply with familiar, two-chord songs you can develop your own ear and learn how to hear when the chords change. Later we move to familiar songs with three chords, and then on to songs with “different” chords like F and A. 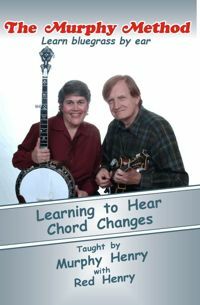 We sing each song and demonstrate the chords on banjo, mandolin, and fiddle. A must for anyone who thinks learning to hear chord changes is a complete mystery. For all instruments.